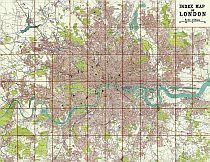 There are currently 73 high quality London maps and views displayed on this site. "Sir, when a man is tired of London he is tired of life: for there is in London all that life can afford." Publisher: Cassell and Company, Limited. London, Paris and Melbourne. 1897. Source: Taken from "Old and New London. A Narrative of Its History, Its People, And Its Places. Illustrated with numerous Engravings from the most Authentic Sources. The City, Ancient And Modern", by Walter Thornbury. Vol. I. 1897. Notes: A 19th century plan of Roman London, after the destruction of Londinium by the forces of Boudica circa AD62. 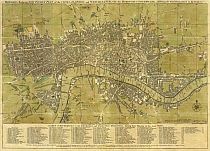 This late 19th century map of London records the main features of Roman London. Various sources are cited by Thornbury in relation to the creation of this plan. The Romans built a defensive wall around the landward side of the city of Londinium sometime between 190 and 225. 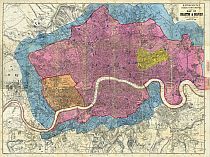 This map of Roman London shows London Wall, thus dating it post AD190. 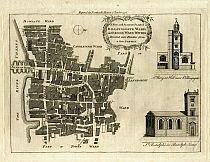 Engraved and Published from the Agas map held in the Guildhall Library. Paper on linen, but not dissected, folded unevenly. Includes reference letters and numbers on many buildings, but there is no key to these. Includes notes by W.H. Overall, F.S.A., Librarian To The Corporation Of London. The City Of London As In Queen Elizabeth's Time. 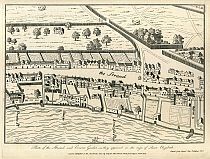 Engraved for Stow's Survey of London (1720). See (2) below for details. Moorfields - Limehouse - St Georges, Southwark - St James's Park. Original engraved print on paper with later hand colouring. In excellent condition. Based on a map of London attributed to Ralph Agas. Refer to Howgego No. 2 (a) for details of Hatton's version of this map. Taken from "Antiquities Of The City Of Westminster" by John Thomas Smith, 1807; containing "Sixty-Two Additional Plates To Smiths Antiquities Of Westminster" by John Thomas Smith, c1809. London. Published as the Act directs, February 24th, 1808, by John Thomas Smith, No. 31, Castle Street East, Oxford Street. Copied from Agas's Map Published 1578, centred on Charing Cross. 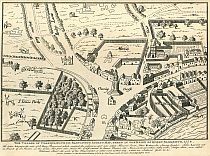 The Village Of Charing, &c.: From Radulphus Aggas's Map, Taken In The Reign Of Queen Elizabeth, 1578. London. Published as the Act directs, June 29, 1809, by John Thomas Smith, No. 4, Polygon, Somers Town. Copied from Aggas's Map Published 1578. London. Published as the Act directs, December 26th, 1807, by John Thomas Smith, No. 31, Castle Street East, Oxford Street. Publisher: J. Coxhead Holywell Street, Strand, Jany 1st 1813. Source: Engraved for "The History And Antiquities Of London" Vol.1, by Thomas Pennant, Esq. London 1813. Notes: Copied from John Norden's plan of 1593 (see Smith's Antiquities 1807). Notes: Copied from John Norden's plan of 1593. London. Published as the Act directs, February 20th, 1808, by John Thomas Smith, No. 31, Castle Street East, Oxford Street. London. Published as the Act directs, June 3d, 1809, by John Thomas Smith, No. 4, Polygon, Somers Town. 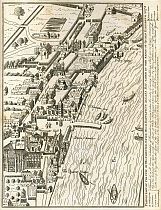 Copied from Claes Jansz Visscher's panorama of London c1616. 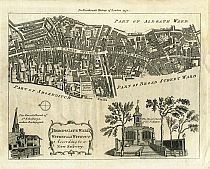 Engraved for "A New and Universal History, Description, and Survey Of The Cities Of London and Westminster, The Borough of Southwark, And Their Adjacent Parts. 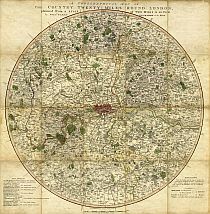 Including not only all the Parishes within the Bills of Mortality, but the Towns, Villages, Palaces, Seats, and Country, to the extent of Twenty Miles round, Comprizing A Circle Of Near One Hundred And Fifty Miles" By Walter Harrison, Esq. 1775. London. Published for Harrison's History of London. 1775. Printed for J. Cooke, at Shakespeare's Head, Pater-Noster-Row. 1775. Includes "An Explanation of the several Forts on the Line of Communication", which details all 23 forts on the London wall. Taken from "A New History of London, Including Westminster and Southwark, to which is added, A General Survey of the Whole; Describing The Public Buildings, Late Improvements, &c. Illustrated WIth Copper-Plates." by John Noorthouck. London, 1773. Printed for R. Baldwin, 47, Pater-Noster Row. 1773. 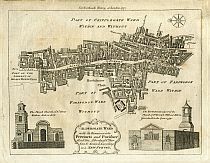 Folding map showing the extent of the Great Fire of London, engraved for Noorthouck's History of London 1772. Includes a Reference To All The Churches Both In The City And Suburbs, and a Reference To Remarkable Places. Based on Wenceslaus Hollar's 1666 map of the Great Fire of London entitled A Map or Groundplot of the City of London and the Suburbes thereof, that is to say, all which is within the Jurisdiction of the Lord Mayor or properlie calld't London by which is exactly demonstrated the present condition thereof, since the last sad accident of fire. The blank space signifeing the burnt part & where the houses are exprest, those places yet standing. 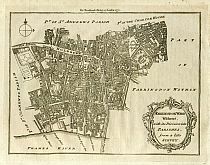 As described by the lengthy title above, the blank part of the map clearly shows the extent of the Great Fire. This map is represented in Howgego as No. 19, Derivative (b). Proposed rebuilding plan of London in the wake of the Great Fire of London, 1666. Plan of Arundel and Essex Houses. London. Published as the Act directs, Augt 20. 1808, by John Thomas Smith, No. 31, Castle Street East, Oxford Street. 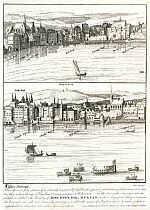 Copied from Ogilby's & Morgan's twenty-sheet plan of London, etched by Hollar. - N.B. 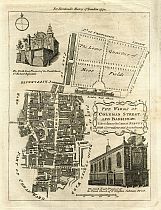 For the friendly loan of this rare print the publisher is indebted to Mr Samuel Woodburn, of St Martin's Lane. London. Published as the Act directs, 30 May. 1809, by John Thomas Smith, No. 4, Polygon, Somers Town. 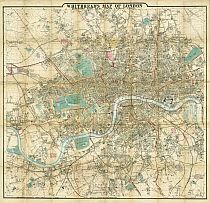 Plan des Villes de Londres et de Westminster et de leurs Faubourgs avec le Bourg de Southwark. Par de Fer Avec Priv du Roy 1700. Nicholas De Fer, Paris. 1700. 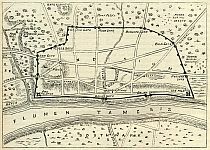 Early plan of London, in French. Key reference table identifying 113 locations throughout London. 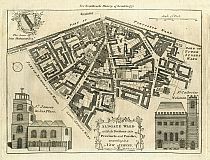 A Plan Of The City's Of London, Westminster And Borough Of Southwark; With The New Additional Buildings. Anno, 1720. Cassell & Company Limited, La Belle Sauvage, Ludgate Hill, London, E.C. Title across top of map. References across bottom of map. Dedication title in cartouche with City arms and insignia, pennons, cornucopiae, etc., at top left. Compass rose and scale at bottom centre. Dedicated to Sir Peter Delme, Knight and Alderman. Site Of The Buildings Which Once Covered The Southern Half Of Deans Yard. London. Published as the Act directs, September 10th, 1807, by John Thomas Smith, No. 31, Castle Street East, Oxford Street. The London Magazine, or, Gentleman's Monthly Intelligencer. London. Published for R. Baldwin, jun. at the Rose in Pater-Noster-Row. Single page from The London Magazine, The Monthly Chronologer section. Printed one side only. Fair/Good condition. Minor discolouration and foxing. Folding plan on 19th century paper. Explanation at bottom left. Title at top right. Very good condition. Single page from The Gentleman's Magazine. Printed one side only. Good condition. No offsetting or foxing. New River Head - Shadwell - Newington Butts - Hide Park. Folding plan on 18th century paper. Hand coloured. Title set in top margin. 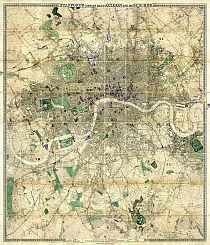 A Plan Of The Cities Of London And Westminster, And Borough Of Southwark. Engraved for Noorthouck's History of London 1772. Aldersgate Ward with its Divisions into Precincts and Parishes And the Liberty of St. Martins le Grand, According to a New Survey. Printed For Noorthouck's History Of London 1772. Aldgate Ward with its Divisions into Precincts and Parishes According to a New Survey. 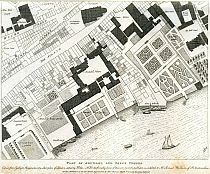 A New and Accurate Plan of Billingsgate Ward, and Bridge Ward Within, Divided into Parishes from a late Survey. Includes the north end of old London Bridge, Pudding Lane, and the Monument. Bishops Gate Ward Within And Without According To A New Survey. Breadstreet Ward And Cordwainers Ward With Their Divisions Into Parishes According To A New Survey. 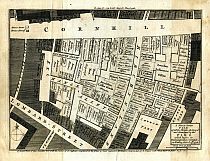 The Wards Of Coleman Street, And Bassishaw, Taken From The latest Survey, With Corrections And Amendments. Farringdon Ward Without, With Its Divisions Into Parishes, From A Late Survey. 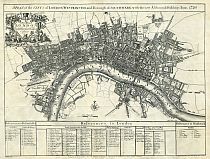 Bowles's Reduced New Pocket Plan Of The Cities Of London And Westminster, With The Borough Of Southwark, Exhibiting The New Buildings To The Year 1775. 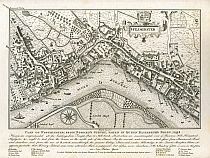 A New Plan Of London 1777. Printed For Carington Bowles in St Pauls Church Yard. Printed for Carington Bowles, at his Map and Print-Warehouse, No. 69 in St Paul�s Church Yard, London. Engraved by J. Ellis, Clerkenwell, London. Scale & compass rose bottom right. Imprint & table of references to churches and principal buildings located below map. Map divided into squares lettered along margins for reference. Built-up areas stippled in city, hatched elsewhere (Howgego pp 126). This is a 1775 map in a later 1777 slipcase. This copy is an earlier state than the first known copy recorded in Howgego as No. 168 (1). General Plan For Explaining The Different Trusts Of The Turnpike Gates In The Vicinity Of The Metropolis. Published By J. Cary, July 1st, 1790. Taken from: Cary's Survey Of The High Roads From London To Hampton Court, Bagshot, Oakingham, [and twenty-three other places in the neighbourhood of the metropolis.] On a Scale of one Inch to a Mile; wherein Every Gentleman's Seat, situate on, or seen from the Road, (however distant) are laid down, with the Name of the Possessor; to which is added The Number Of Inns on each separate Route; also, The different Turnpike Gates, shewing The Connection which one trust has with another. London: Printed for J. Cary, Engraver & Map seller, the corner of Arundel Street, Strand. July 1st. 1790. Hand coloured map on paper. Good condition with some foxing, offset and staining. 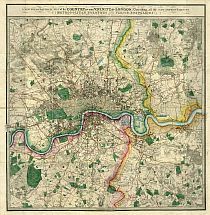 Single page map showing the main thoroughfares of London in 1790, with every turnpike, and the area of every turnpike trust shown by a different colour. The Thames, the turnpike gates, and the areas of the trusts are coloured. The title is in a raised panel along the top of the map. In the upper two corners are the names of the gates with references by numbers and references to the colours on the map, and other notes. Imprint details in panel below map. CARY's New and Accurate Plan of LONDON and WESTMINSTER the Borough of Southwark and parts Adjacent: viz. Kensington, Chelsea, Islington, Hackney, Walworth, Newington &c with an Alphabetical List of upwards of 500 of the most principal Streets with references to their situation. John Cary, Map & Print-seller, No. 188, corner of Arundel Street, Strand. Folding map. Slipcase torn and in poor condition, though label is better preserved. Map consists of hand coloured sections laid down on linen. Map title above top border. Table of references to public buildings at top left, and to churches at top right. The map is divided into squares numbered for reference. The main table of references is below the map outside the border. There is no key to the stippling or symbols used (Howgego pp134-5). Plan Of The Proposed Docks, And The Line Of A Canal, With A Collateral Cut, On The Surrey Side Of The River Thames, Surveyed By Order Of The Committee Deputed For The Inhabitants Of Southwark, By C. T. Cracklow. St. Thomas's Street, Borough. Map Maker: C. T. Cracklow, 1803. Published: Ordered by the House of Commons to be Printed 11th July 1799; - And to be Re-printed 1803. Notes: Plan showing layout of proposed Surrey docks at Rotherhithe, and the line of a proposed 2¼ mile canal from the docks to Bank Side. Chelsing - Tilbury - Dorking - Eton. Folding map, hand coloured in outline, with parks coloured. Explanation bottom left and bottom right outside map. Imprint and scale below. This map is recorded in Howgego as No. 193 (2). The first edition of this map was published by Faden in 1790. The date imprint of this edition has been changed to "Sepr 1st 1800". Paddington Canal is shown on the map. Folding map. Slipcase in poor condition, though label is better preserved. Hand coloured sections laid down on linen. Title on oval at top left. Explanation of symbols, Hackney-Coach Fares and Scale at bottom right. This map is extended East by an extra sheet 17¾" x 8¼", from Rotherhithe to Stepney. An unrecorded variant of Howgego No. 214 (4), this copy does not include the additional title "The Isle Of Dogs and the New Docks for the West India Trade" in an oval at the top left as cited in Howgego, nor the imprint "Published May 18th 1801 by J. Wallis". Folding map. Hand coloured sections laid down on linen. Title on oval at top left. Explanation of symbols, Hackney-Coach Fares and Scale at bottom right. 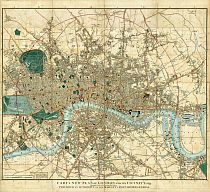 This map is extended east by an extra sheet 11¾" (30.0cm) wide, from Stepney to Greenwich Marsh. 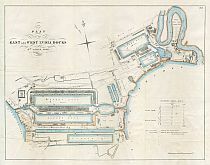 Additional title "The Isle Of Dogs and the New Docks for the West India Trade" in an oval at the top left. The Strangers Guide Through the Streets of London and Westminster. &c.
A New and Correct Plan of London and Westminster with the latest Improvements. Wards Plan of London. Printed & Sold by W & T. Darton, Holborn Hill. Pubd. Jany 12th 1814 by Willm. Darton, 58 Holborn Hill, London. First title in top border. Second title in oval at top right. Compass star and map scale at bottom right. 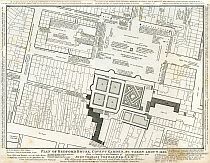 Plan of the Rules of the Fleet Prison inset at top left. Map divided into squares lettered for reference and table of references below map. City area, open spaces, etc., are coloured. Includes a "List of 200 principal streets with letters of reference to their situation" in the bottom margin. Recorded in Howgego as No. 245 (4). 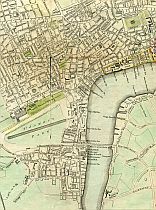 An Entire New Plan Of The Cities Of London & Westminster, & Borough Of Southwark; The East & West India Docks, Regent's Park, New Bridges, &c. &c. With The Whole Of The New Improvements Of The Present Time. Published July 1st 1817 by W. Darton, Junr. 58 Holborn Hill. Folding hand-coloured map of London. Hand coloured sections laid down on linen. Title at top right. Explanation and Scale at top left. Taken from "Walks Through London, Including Westminster and the Borough of Southwark, with the Surrounding Suburbs; Describing Every Thing Worthy of Observation in the Public Buildings, Places of Entertainment, Exhibitions, Commercial and Literary Institutions, &c. Down to the Present Period. Forming a complete Guide To The British Metropolis, In Two Volumes", by David Hughson, L.L.D. 1817. Printed for Sherwood, Neely, and Jones, Paternoster-Row, London; et al., 1817. Published by W. Clarke, New Bond Street, Mar. 1. 1817. This walk, taken from Volume II, shows the "Propos'd New St." north of Carlton House, which became Regent Street. Hyde Park Corner, Turnpike, Grosvenor Place, Piccadilly, Queen's Palace, Garden, Constitution Hill, Green Park, The Road To Chelsea, Bason, Pimlico, Green Coat School, Bridewell, Tothill Fields, Grey Coat School, Peter Street, Almonry, Queen Square, St James's Park, Pagoda Bridge, St James's Street, Pall Mall, Palace, Marlborough House, Carlton House, Proposed New Street (Regent Street), St John Church Yard, Horse Ferry, Millbank Street, College Garden, Old Palace Yard, Sanctuary, New Palace Yard, House of Lords, House Of Commons, Westminster Bridge, Privy Garden Stairs, Admiralty, Horse Guards, Treasury, Whitehall, Charing Cross, Scotland Yard, Northumberland House, & Whitehall Stairs. Published by W. Clarke, New Bond Street, Apr. 1. 1817. This walk, taken from Volume II, shows the "Projected New Street" north of Oxford Street running into Portland Place. This became the north end of Regent Street. Edgeware Road, Great Cumberland Street, Great Quebec Street, Portman Square, Baker Street, Manchester Square, High Street, Welbeck Street, Wimpole Street, Cavendish Square, Harley Street, Projected New Street (Regent Street), Portland Place, Road To Regent's Park, Great Portland Street, Portland Road, Berner's Street, Hospital, Fitsroy Square, Charlotte Street, John Street, Tottenham Court Road, The New Road To Paddington, & Oxford Street. 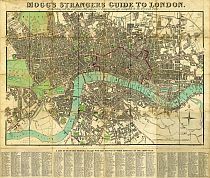 Pigot & Co.'s Metropolitan Guide & Book Of Reference To Every Street, Court, Lane, Passage, Alley And Public Building, In The Cities Of London & Westminster, The Borough Of Southwark, And Their Respective Suburbs. 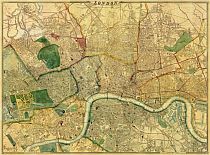 Compiled & Arranged from Actual Survey & accompanied with a New Plan of London divided into Seventy districts, which are referred to by figures in the Street & List. 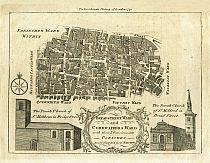 - The whole made so easy of Comprehension as to be essentially valuable to Strangers, & of the greatest use to the resident Nobility, Gentry, Merchants, Tradesmen, &c.
Map Title: Pigot & Co.'s Miniature Plan Of London & Vicinity, With The Geographical Bearings From The Dome Of St. Pauls. Formed into 70 Divisions by means of Circular &c. lines each Circle being 6 Furlongs or ¾ of a Mile from the next when measured in a direct line. Folding map, included with Pigot & Co.'s Metropolitan Guide. Title at top right. Scale near bottom centre. 70 divisions of map numbered for reference to the street index. Waterloo and Southwark Bridges and Stamford Street shown, but not York Road, Lambeth. Carlton House shown. G.F. Cruchley, Map-Seller, 38 Ludgate Street, London. Engraved and Published from a plan by Arrowsmith. Folding plan, with hard cover slipcase. Hand coloured sections laid down on linen. Title set in top border. Imprint and reference to symbols in lower border. References to size and date of opening of docks in lower border. Les Capitales De L'Europe. Promenades Pittoresques. Paris. Marcilly Fils Aine, Rue S.-Jacques, No 21. Hand-colored aquatint of the Parish or St. Marylebone, from Charles Malo's series on the capitals of Europe. Fine condition, due to presence of a tissue guard, which seems to have been lately removed. Charles Malo (1790-1871) produced a series of books on the capital cities of Europe, including Berlin, Constantinople, Londres, Madrid, Paris, Rome, St. Petersbourg, and Vienne. The volumes, in French, record details of daily life in the cities, historical information, and architectural details of churches and significant public buildings. Islington - Limehouse - Newington Butts - Hyde Park. Folding plan, with hard cover. Hand coloured sections laid down on linen. Title on cover only. Explanation top left. Compass rose top right. Scale bottom right. Boundaries etc. coloured to accord with the explanation. New and Old London Bridge shown, also St Katharine's Dock (opened 1828). New London Bridge shown as an "Intended Improvement" (it opened in 1831). Pentonville - Ratcliff - Kennington - Brompton. Folding map. Slipcase missing. Hand coloured sections laid down on linen. Title in top margin. Imprint below map in bottom margin. Date added above compass star. Map squared and margins lettered and numbered for reference. List of 500 "Principal Places" below map. 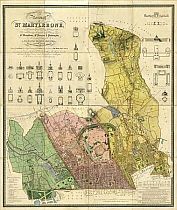 Topographical Survey Of The Borough Of St. Marylebone, As Incorporated & Defined By Act Of Parliament 1832. Embracing & Marking The Boundaries Of The Parishes Of St. Marylebone, St. Pancras, & Paddington, Also The Extents & Limits Of The Principal Landed Estates Within The Borough, And Plans & Elevations Of The Public Buildings. Engraved by B.R. Davies From Surveys & Drawings By F.A. Bartlett Under The Direction Of John Britton F.S.A. &c. &c. &c.
Inscribed To The Dukes Of Bedford, Portland, & St. Albans, The Marquis Camden, The Lord Bishop Of London, Lords Mansfield & Southampton, E.B. Portman, Esq., & Other Landed Proprietors. 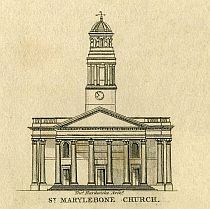 Folding map of St. Marylebone. 16 hand coloured sections laid down on linen, folding into a hardback cover, in good condition. The map is in excellent condition, with only minor offsetting and age toning. The label on cover reads "Survey Of The Borough Of St. Mary-le-bone 1834." The information on the map is updated to 1834. Taken From Moule's "The English Counties Delineated; or, A Topographical Description Of England." 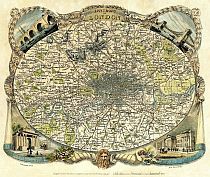 Hand coloured engraved paper map of London. Imprint and scale below map. 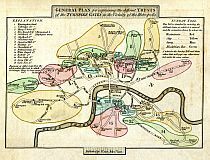 Based on James Bingley's Environs Of London map published 3 Nov 1828 (Howgego No. 315). Oval foliate and cornucopia vignette border, with image of Old Father Thames bottom centre. The cornucopia contain (left) fruit, flowers and wheat, representing Agriculture, and (right) ivory, gold chain, pearls, jewels and coins, representing Commerce. This is a pretty little map of equal artistic and cartographic merit. Cary's New Plan of London and its Vicinity, 1837. Shewing the Limits of the Two-penny Post Delivery. Published by Authority of His Majesty's Post Master General. Cary's New Map Of London, And Its Adjacent Villages, Published By Order Of His Majesty's Postmaster General, Showing The Present Boundary Of The Two-Penny Post Delivery, And The Limits Of The Hackney Coach Back Fares. G. And. J. Cary, 86, St. James's Street. Folding plan, with hard cover slipcase. Hand coloured, laid down on linen. Title in bottom margin. Scale bottom left. Note regarding limit of two-penny post bottom left. No publishers imprint. Map divided into squares lettered for reference. City boundary, open spaces, etc., coloured. Position of Hungerford Bridge shown. This state recorded as Howgego No. 279 (11). C.B. Graham, Lithographer, Washington D.C.
United States Senate Document G.2., 30th Congress, 2nd Session. Bromley Marsh - River Lea - Timber Pond - River Thames. Folding plan on 19th century paper. Hand coloured plan, backed with archival tissue. Title at top left. Very good condition. Hand coloured folding map of London, dissected and mounted on linen. Paper label adhered to endpaper reads "John Betts, Map Publisher, 115 Strand". Title set in top border. Explanation of colours and imprint set in bottom border. The railways entering London are coloured blue. No date on map. Moorgate Street and location of Hungerford Bridge shown, confirming this edition as Howgego No. 360 (2). Map divided into half mile squares and margins lettered and numbered for reference. References to Public Buildings, Exhibitions &c., Theatres, Police Offices, and Miscellaneous Buildings below bottom margin. Decorative motifs at corners. The bottom margin includes the map price "In Sheet 2s/6d", and "In Case 4s/-"
Lacking slipcase. A fine example of this map. 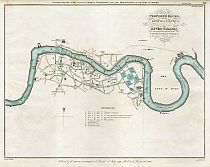 Panorama Of The River Thames In 1845. Given With The Illustrated London News. Supplement To The Illustrated London News, January 11, 1845. This balloon or birds-eye panoramic view of the River Thames and London was issued as a Supplement to the Illustrated London News on Saturday, 11 February 1845. The panorama is in excellent condition, with visible fold lines as issued. It has been engraved in sections, which have been assembled in two halves for publication. Islington - East India Docks - Peckham - Hyde Park. 8 miles East to West & 5 miles North to South. Folding plan, with hard cover slipcase. Hand coloured sections laid down on linen. Title set in top border. Explanation and imprint set in bottom border. Date added below imprint. Map divided into half miles and margin marked off in half miles. References to parishes at top right. London 1857. Drawn & Engraved Expressly For The Post Office Directory. Post Office Directory Map Of London With Patent Index. Dalston - East India Docks - Camberwell - Bayswater. Title and imprint at top right. Scale in bottom margin. Very early Tape Indicator map, with full index and references to every street shown on map. Printed by Maclure, Macdonald & Macgregor's New Patent Machine. 37 Walbrook, London. Full Title: The West-End Railway District, London. Engraved and published for the Illustrated London News, on bright, good quality newspaper. Central fold as issued. Key to the view included in the volume. Cross's London. A New Plan Of The Metropolis. J. Cross, 18, Holborn Hill, Opposite Furnivals-Inn. E. Weller, Lithogr, 34, Red Lion Square. Upper Holloway - East India Dock - North Brixton - Kensal Green. Folding plan, with hard cover slipcase. Hand coloured, laid down on linen. Title set in top border. Explanation and imprint set in bottom border. Date added below imprint. Map divided into half miles and margin marked off in half miles. References to parishes at right. Full Title: London From The South Side Of The Thames. Engraved and published as a supplement to the Illustrated London News, on bright, good quality newspaper. Folded as issued. Key to the view included. Josiah Whitbread, Map-Seller, 142, Oxford Street. Coloured folding map on paper, laid down on linen. Hard card cover. Title at centre in top border. Imprint, explanation of railway symbols, and scale in bottom border. Divided into squares lettered and numbered in border for reference. Includes street index. 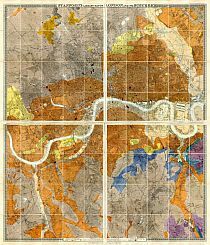 A New Topographical Map Of The Country In The Vicinity Of London, Describing All The New Improvements, Metropolitan Boroughs And Parish Boundaries. London & Envs. James Wyld, Geographer To Her Majesty. 457 Strand. Charing Cross. (East.) 2 Doors Down From Trafalgar Square. Maps, Charts, Globes, & Geographical Works Of Every Description. Published By James Wyld, Successor To Mr. Faden, Geographer To Her Majesty, Charing Cross East. The slipcase label includes a handwritten date of 1872. Title imprint in border above map. The margin is divided into miles N, S, E, & W of the meridian and parallel of St. Paul's, County boundaries, roads, etc., are coloured. No key or hatching symbols. A later variant of Howgego No. 250. Dated at c1872, but actual date to be determined. NB. The Circle round London denotes the extent of the Four Mile Radius, and beyond which Hackney Carriages charge Back Fares. 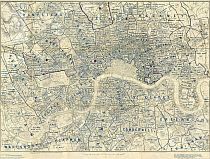 Map Of London Showing The Boundaries Of Parishes, Ecclesiastical Districts, And Poor Law Divisions. Published by Edward Stanford, 55, Charing Cross, London. Original map published July 2nd, 1875. This copy revised July 1877. Folding map. Sections laid down on linen. Hand coloured in outline. Explanation, scale bar, and imprint in bottom margin. The population of each district is shown. Recorded in Hyde as No. 157 (1). Title top left. Imprint and scale in bottom margin. The School Board Of London map, City of London Division, is recorded in Hyde as No. 168 [ii]. Title bottom left. Imprint and scale in bottom margin. The School Board Of London map, Westminster Division, is recorded in Hyde as No. 168 [x]. Corrected to 1 January 1877. Republished with the geological colouring on 1 May 1878. Ordnance Map Department. Forster Groom & Co., Geographers & Map Specialists. 15 Charing Cross, London , S.W. Near Whitehall. South Mims - Woolwich - Walton On Thames - Windsor. Folding paper map, linen backed, with hard cover. Printed colour. Title, Scale and Middlesex Statistics top left. Explanation Of Signs bottom centre. Some London Statistics bottom right. Publisher's label pasted on at bottom center. Stained and foxed, but generally in good condition. Divided into squares lettered in upper and lower case in border for reference. The reference index is not included with this map. 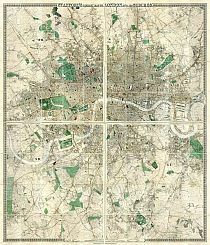 Map Of London Published In The Post Office London Directory For 1886. Metropolitan Goods Conference. Map Of Collection & Delivery Boundaries. January 1st 1886. Lithog. Kelly & Co. London & Kingston. Printed & Published By Kelly & Co. Post Office Directory Office, 51 Great Queen Street, Lincoln's Inn Fields, London. W.C.
Paper title stuck over previous map title top right. Scale bar top right. "The Pink Boundary Includes St. George's Road, Green Street To Upton Park Station (L.T. & S.R.)" "Includes Albert Docks And Firms Between The Docks And The River Side." Recorded in Hyde as No. 61 (29), but with 1886 dated title similar to Hyde No. 61 (12) dated April 1st 1869. Edward Stanford, 26 & 27, Cockspur Street, Charing Cross, S.W. Coloured folding map on paper, laid down on linen. Hard card cover. Title in top margin. Scale in margin at bottom left. Imprint in bottom margin at centre. Shows omnibus routes. 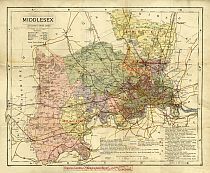 Handy Reference Atlas Of London & Suburbs By J.G. Bartholomwe, F.R.G.S. From Latest Surveys Showing Street Names As Altered By L.C.C. With Complete Index To Streets, Public Buildings, Etc. Atlas of London by John George Bartholomew. Slightly predates the construction of White City for the 1908 Olympic Games, although the vacant site is clearly visible. Includes a 68 page "General Index To Streets, Public Buildings, Railway Stations, Etc." Johnson, Riddle, & Co. Ltd., London, S.E. Taken From "Cook's Handbook For London. With Two Maps And Six Plans." Thomas Cook & Son, Ludgate Circus. Simpkin, Marshall, Hamilton, Kent & Co., Ltd.
Folding paper map of London Underground. Machine colour. Bound into "Cook's Handbook For London". In very good condition. 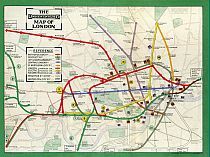 The map includes details of the Metropolitan Railway, District Railway, City & South London Railway, Central London Railway, Great Northern & City Railway, London Electric Railway (Bakerloo Line, Piccadilly Line, & Hampstead Line), Brighton Railway (Elevated Electric), & Waterloo & City Railway. This map will be of interest to family historians researching their family in the 1911 Census of London. E.J. Lovegrove, M. Inst. C.E., Engineer & Surveyor, Town Hall, Highgate, N.6. 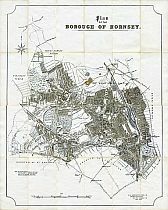 Folding map of the Borough of Hornsey, laid down on linen. 24 folding sections with marbled end boards. Original slipcase not present. Unrecorded variant of Howgego No. 168, being between States (8) & (9). Unrecorded variant of Howgego No. 192, being between States (5) & (6). Howgego No. 317 (9), although MAPCO's copy differs from the D&H description.